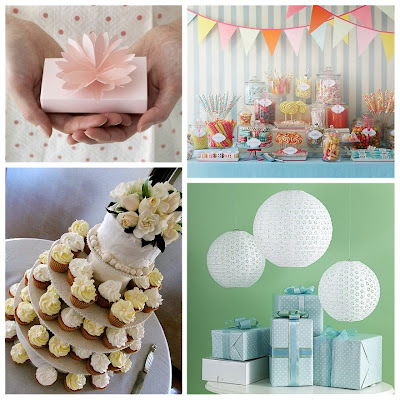 'm looking for wedding shower inspiration for a wedding shower I'll be hosting in August. A theme hasn't been decided on with the bride yet, but I'm still looking. You know how I love to host a party! I'm hoping to narrow a few things down soon, like number being invited and a theme, so I can start looking for goodies that will work during the upcoming wedding season. Serving a cupcake cake, or I may go with mini cheesecakes since I know the bride is partial to them. Have you seen anything especially unique or exceptionally pretty done lately at bridal showers? Great ideas. I always love those little flag banners, they're so sweet. I love that cake. I went to one awhile back where the top was cheesecake and bottom layer was white cake but edged with Godiva Truffles. I love that idea Meredith! I'll run it by the bride. I keep coming back to this post but I can't ever think of anything since a} it's been so long & b} my friend's showers were all ages ago as well! I LOVE the truffles & cheesecake idea though.